CHICAGO – The Chicago Sky selected University of Connecticut guard/forward Katie Lou Samuelson with the No. 4 overall pick of the WNBA Draft 2019, held this evening at the Nike New York Headquarters in New York. Samuelson comes to Chicago to begin her professional playing career after a record-breaking four years at the collegiate level with the Huskies. She currently ranks fourth in scoring in UConn women’s basketball history and second in three-pointers made. In January 2019, Samuelson surpassed the 2,000-point career mark, becoming only the 10th player in program history to reach the milestone. The 6-foot-3 Huntington Beach, California native is a three-time WBCA All-American, two-time AP First Team All-American, three-time All-AAC First Team selection, and two-time AAC Player of the Year. In her senior year, she was unanimously selected to the All-American Athletic Conference First Team and named AAC Defensive Player of the Year. She helped the Huskies to a 2016 national title and finished her career at UConn with 2,342 points, 627 rebounds, 455 assists, and 382 three-pointers. In the second round, the Sky acquired Final Four Most Outstanding Player Chloe Jackson out of Baylor with the No. 15 overall pick. 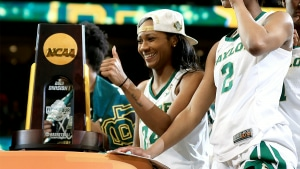 A 5-foot-8 guard, Jackson recently led Baylor to the 2019 NCAA Championship over defending champion Notre Dame, recording a season-high 26 points and sinking the winning bucket with only 3.9 seconds left in gameplay. 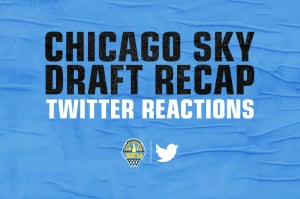 With the Sky’s third-round and final pick of the 2019 WNBA Draft, the team selected Spanish small forward Maria Conde. Conde current plays for Poland’s Wisła Can-Pack Kraków and the Spanish national team. In EuroCup play, the 6-foot-1 Conde averaged 10 points, 2.2 assists and 4.2 rebounds per game. The Sky will begin training camp on May 5 before tipping off the 2019 regular season on the road against the Minnesota Lynx on May 25. Tickets for all home games at Wintrust Arena are available now by visiting sky.wnba.com or by calling (866) SKY-WNBA.